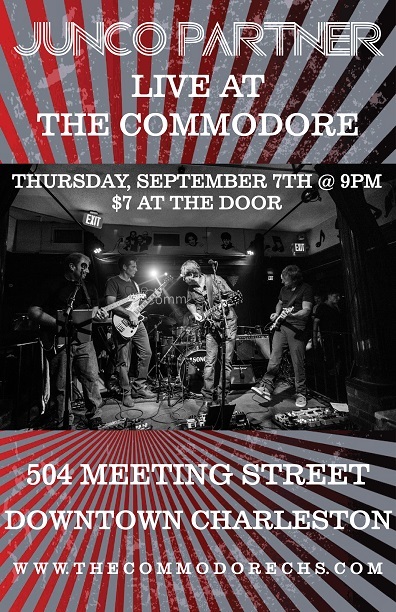 Junco Partner will be playing live at The Commodore on Thursday, September 7th from 9:00 – 11:00 with a $7 admission at the door. Based out of Charleston, SC, Junco Partner delves into the realm of funky rock jams. The group features Joe Keenan, vocals / guitar, Matt Hastings, bass and Kevin Wadley, and TJ Dildy on guitars, Jack Friel, drums and Alan Brisedine on keys. Spirited vocals and playfully verbed guitar tones are common place with their music and lend to versatile bass melodies and driving drum rhythms. Whether performing original music or covers, Junco Partner draws from each member’s musical experiences to create their own native sound.